Moving can be as tedious as it is refreshing.. I wanted to make packing easy and unpacking even easier. Smooth Transition is the name of the game!!! So I have started small with closets and drawers first. I want to put my things on display, but until we are officially in the new home, I’m getting things packed nicely! One of my favorite things about moving is you really get to take at look at your belongings and figure out what is worth taking. I’m a pretty organized person generally, but when it comes to makeup, the clutter seems to pile up. You know the feeling?! You buy countless shades of pink lipgloss and so many variations of brown eyeshadows it starts to take over. I’ve been wanting to go through all my cosmetics for quite some time. I have bags of makeup in both of my bathrooms..my Jeep…my closet..it’s everywhere. So it was time to take a hard look at my makeup hoarding skills. -Anything that had 1/4 or less product had to go. Now granted, most of those products that were that close to empty hadn’t been used in months, if not longer, so tossing was a good thing. -Divide and conquer… Pick you favorites! We are all guilty of seeing a makeup look that was gorgeous and bought all the blue eyeshadow to recreate it..then, said eyeshadow, just sat in your bathroom till it expired. Toss the the stuff you never use or donate it if you still can! Don’t let it die a slow death in the back of your bathroom cupboard!! -Replace or clean old makeup brushes. I am planning to replace most of mine and display coordinating ones..so I only saved the good ones and tossed the ones I had multiple of. Don’t get me wrong..I kept all my more daring makeup too! The dark shades of lipstick and eyeshadows that I typically only use for a night out with the hubby got its own bag to keep in our new bathroom. I also have a larger coordinating bag that goes along with these that carries my liners and tools. I love opening a bag and seeing my favorite lipsticks in one bag.. My favorite individual eyeshadows in another.. So hopefully this helps anyone like me who let things get way too out of control! I will definitely keep showing you tips and very excited to show you the end results next month!! Stay tuned!! No problem! It’s feels great moving. I love having only what we need and going about things more simply! Same here:) Congrats on your move! Very exciting! If you are looking for more storage ideas for when you finish your move, I ordered the Lori Grainer Tabletop Spinning Makeup organizer and I can’t wait for it to get here. I saw several reviews on it and it is a great addition your makeup storage options. Those bags are so cute!! 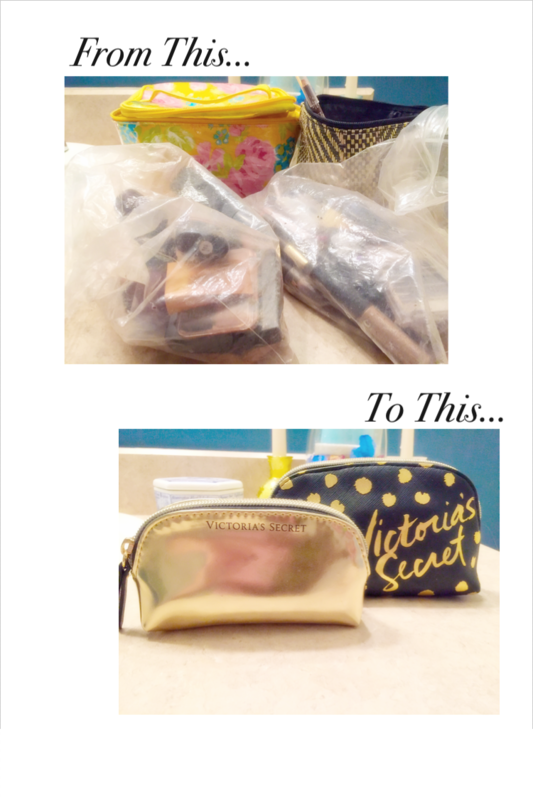 I think I need some new makeup bags!